Ninth fort on the outskirts of Kaunas city is a memorial built for remembering tens of thousands of civilians mass murdered by Nazis during the world wars. On 20th of November, 1941, 1000 Jewish men and women were brought here from Munich, Germany and executed five days later. More than 5000 Russians, Jews, Lithuanians were mass murdered here by the Nazis during world war. The significance of Ninth fort was that it was the first place where Hitler's commanders began mass killings of people. Before this the practice was to relocate Jews to concentration camps (where they would die slow deaths eventually). But later Nazis found it a big headache to relocate people and found it more convenient to get rid of them. Kaunas is believed to be one of the spots where several trains carrying Jews was diverted to and then killed. Wikipedia has detailed article here. Lots of soviet soldiers have perished here, count not known. Today the memorial stands in memory of those who perished for no fault of theirs. 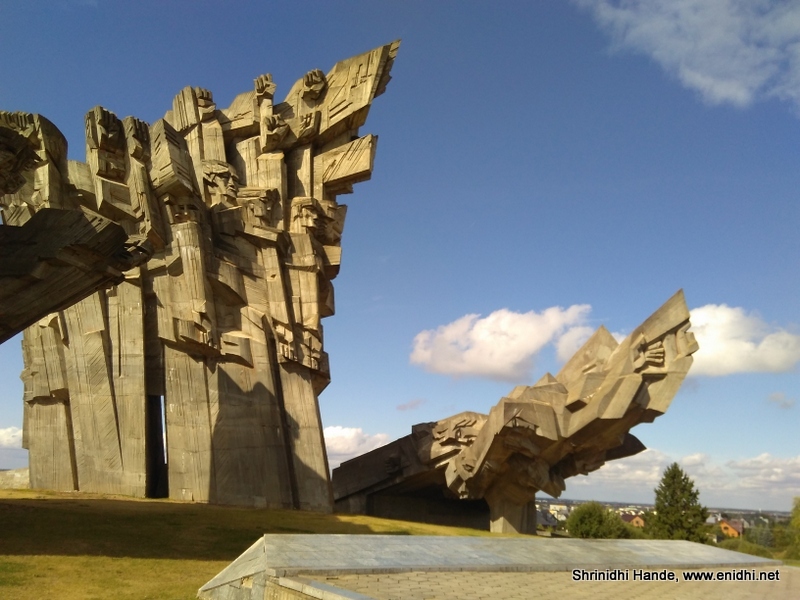 The monument is made of a series of concrete slaps. A close look at the monument shows faces and hands. Two main structures and a small one seem to represent a family- father, mother and child, when seen from far. Today we complain about petrol prices, slow speed internet and stuff like that. Decades ago there were people who were lucky just to be alive for one more day. Adjacent to the memorial is a fort and a museum about which I will write a separate post. 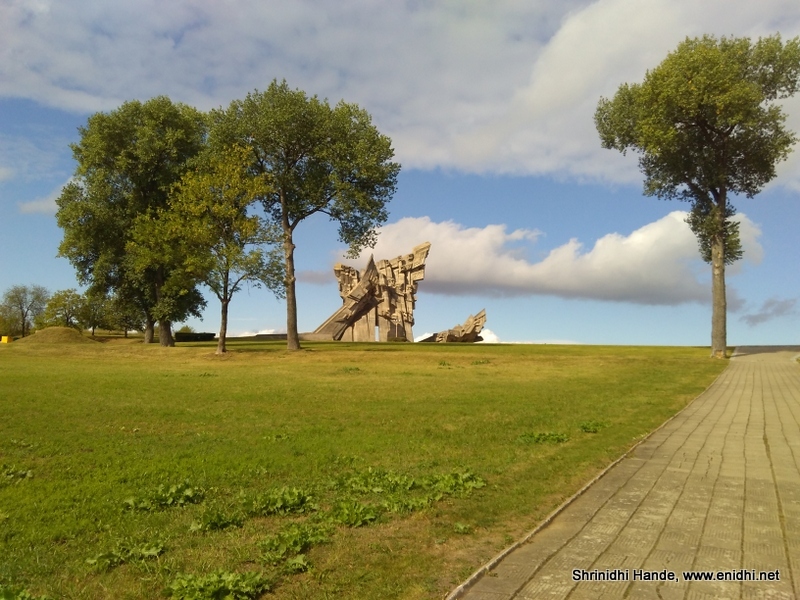 9th fort memorial is some 7 to 8 kms away from Kaunas city. I took a taxi to there which cost me 9 euros. But after spending some time at the memorial, I had no transportation back. There is no public transportation to 9th fort. It is not projected as a tourist attraction. Only local people come here in their cars when free, spend a few moments in memory of their grand parents/forefathers who might have lost their life during the world wars. There is a highway nearby, but I couldn't spot any taxi. I tried asking lift from few cars, but it didn't work. No one stopped for me. Eventually I started walking towards the city (I didn't have a data plan in mobile, but my airtel prepaid and google maps helped me identify where I was in the map and I could figure out if I am moving towards the city or away from it). After walking for 2 kms I found a bus that goes to city centre. Wonderful works. Glad to know about this.